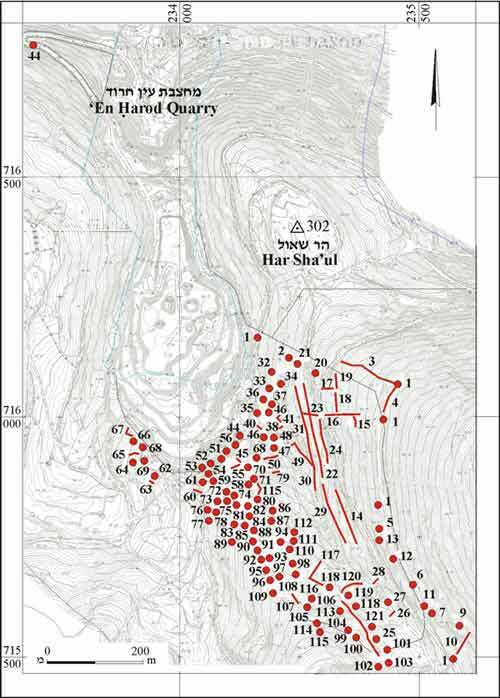 During September 2006, a survey prior to development was conducted at the ‘En Harod quarry on the Gilboa (Nuris), east of Gide‘ona (Permit No. A-4892; map ref. NIG 23425–500/71550–625; OIG 18425–500/21550–625). The survey, undertaken on behalf of the Israel Antiquities Authority and underwritten by the Lime & Stone Production Company, Ltd., was directed by Y. Tepper, with the assistance of A. Shapiro (GPS) and Y. Finkelstein. 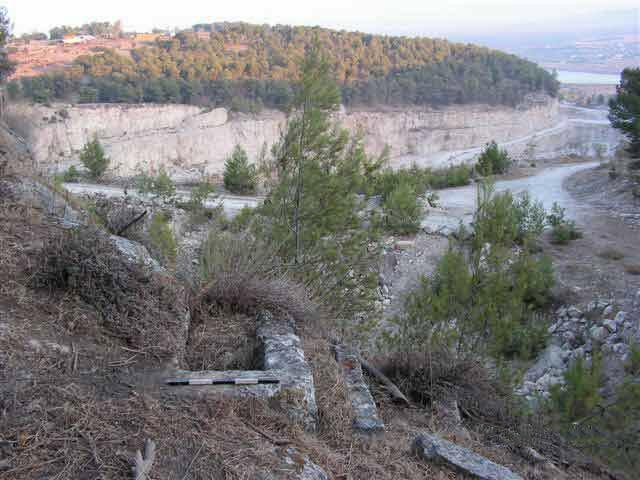 The ‘En Harod quarry is located in the Yehonatan stream channel, which descends from Mount Sha’ul to the Harod Valley. A burial cave was discovered in the past within the confines of the quarry (ESI 14:73). The survey was carried out along the eastern and western slopes of the stream where field walls, stone clearance heaps, dams, installations, quarries, caves and a field tower were documented (Fig. 1). Potsherds could not be gathered because the ground was covered with pine needles and therefore, it was not possible to date the remains. Walls that delimited cultivation plots and a few farming terrace walls were on the slopes of the stream and it was readily apparent that the area was divided into small plots. The walls were haphazardly built of fieldstones and large rocks. Three dams were located in the stream channel and c. 10 large stone clearance heaps on the eastern side of the channel attested to intensive agricultural activity in the area. Most of the remains were on the western slopes. Two winepresses with a treading floor and a settling pit (110, 114) and another installation (101), which was probably a winepress that was partitioned into two cells whose surfaces were smoothed, were documented. Cupmarks were found on another bedrock surface (62). 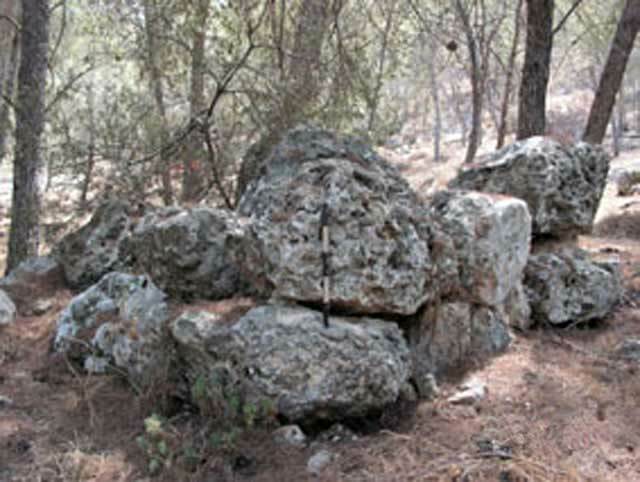 Five square shafts (average dimensions 2 × 2 m) filled with alluvium were identified and a hewn step was noted in one of them (57–59, 72, 97). Eight cist graves were recorded; three were located at Site 53 (Fig. 2) and the rest were distant from each other (78, 91, 92, 96, 108). Twenty-seven cave openings were found, mostly blocked and sealed. Quarries and installations were located next to some of the caves (7, 71, 84, 86, 88, 93, 95, 111, 121) and therefore, it is reasonable to assume that they were used for human activity. On the western slope was a single structure, built of large stones and preserved three courses high (Field Tower 100; 3 × 3 m; Fig. 3). A dozen quarrying sites, used mostly for the extraction of ashlar stones, including quarries that consisted of several rock-cutting terraces (11, 52, 56, 60, 69, 70, 81, 87, 89, 94, 112, 113), were identified. The survey findings show a rural, farming region on the slopes of the Gilbo‘a. It seems that in antiquity the region was used for agriculture, burial and stone quarrying, most likely by the inhabitants of the abandoned village of Nuris, located to the southwest of the quarry, where remains from the Bronze Age until the Ottoman period were discerned (N. Tsori, 1977, Nahalat Issahar, p. 5) or by the residents of other nearby villages. 2. Cist graves along edge of quarry, looking north. 3. Built corner of field tower, looking west.